Take NC 43 to US 17. Follow US 17 to US 70 E/US 70 BR/NC 55 W exit towards New Bern and Havelock. Keep to the right at the fork on the ramp. Turn right onto NC 55. Turn right onto Drawbridge Street. At the next intersection, turn left onto South Front Street. Go to the second light. Turn right onto Middle Street. Go one block to New Street. Turn left and make the first left into the courthouse parking lot. 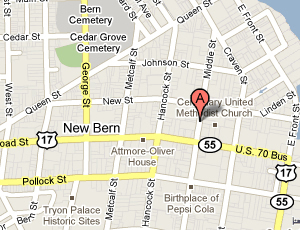 Take US 70 to New Bern. Take the downtown Business exit at the bridge. Turn right onto NC 17 Business. Turn right onto Drawbridge Street. At the next intersection, turn left onto South Front Street. Go to the second light. Turn right onto Middle Street. Go one block to New Street. Turn left and make the first left into the courthouse parking lot. Take NC 32 to US 17 South. Follow 17 South to US 70 E/US 70 BR/NC 55 exit towards New Bern/Havelock. Keep right at the fork in the ramp. Turn right onto NC 55. Turn right onto Drawbridge Street. At the next intersection, turn left onto South Front Street. Go to the second light. Turn right onto Middle Street. Go one block to New Street. Turn left and make the first left into the courthouse parking lot.